The goal of each practice session is to give team members a chance to work on their fielding and battings skills. The format is informal, with activities elected by those who attend. Activities range from simple toss and catch sessions to fielding and batting drills. Suggestions are always welcomed. No schedule will be released. All practice sessions are held on an ad-hoc basis. Extra Innings (Woburn) - $20/30 min. Manual and automatic. Fenway Golf (East Longmeadow) - $10/7 tokens. Fully automated. Vince's Sports Center (Newark, DE) - $10/~7 rounds. Fully automated. The field is believed to have been created by Polaroid, who once owned the land where the MMS office park resides today. 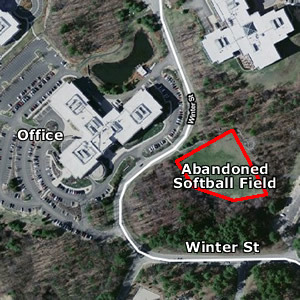 Usage of the field for softball activities ceased once it was purchased by MMS. Future play was discouraged by planting trees on field. It is believed that the field is maintained and mowed regularly because it provides a clearing in the tree line. From the clearing, the Boston skyline can be observed from the upper floors of the complex. Due to the growth of trees on the field, there is not enough room for hitting practice. However, there is plenty of room for fielding drills, tossing the ball around, or some light hitting practice. Below is a map of other nearby fields in the area. We can consider using one of these if the need arises. Graverson Playground - Has a little league field with plenty of space in left field for power hitting. Lefty may have trouble hitting the tennis courts. James Falzone Memorial Park - Was originally a baseball field, is now a soccer field. The original diamond and backstop are still there. Field is scheduled to be replaced with an artificial turf soccer field. Field is rarely used but well kept. Unavailable: new field being built. Lazazzero Playground - Has a little league field out back that is great for hitting and fielding drills. Veterans Memorial Athletic Complex (Not shown) - The fields we play our games on are typically vacant on weekends. If games are scheduled to be played on these fields, then they are typically free after 5pm. Their general availability makes them a great location for a possible practice session.